"Customers say the paper works well, is easy to use, and they find the company’s website helpful." "The paper is transparent, which makes for precise positioning, and a special top coating means it will stand up through washing." "It’s easy to print out and transfer images, and the images hold up well after washing." "You can use it to personalize everything from t-shirts to sweatshirts, bags and beyond—pretty much anything that’s made of 100 percent cotton or cotton/polyester blend." "It stands out from other papers because it also offers room for stretch." "For every two hours it’s exposed to sunlight, it glows for 10 hours." "No matter if you want to transfer onto dark material, light material or something in between, this paper works for them all." "These 11" x 17" opaque sheets are great for images that won’t fit on traditional 8.5" x 11" sheets." 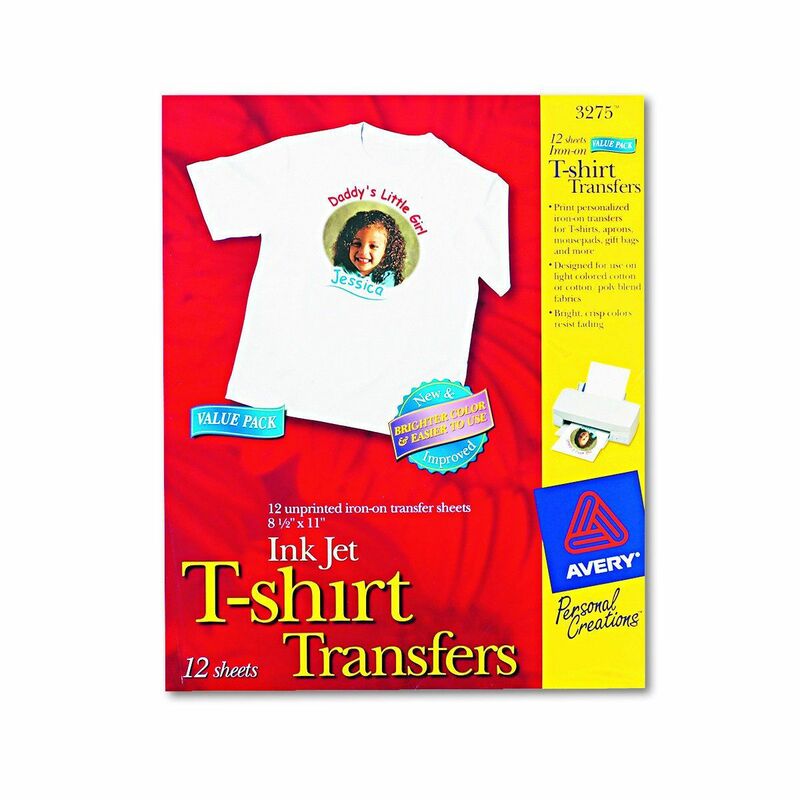 For an all-around reliable, easy-to-use iron-transfer paper, Avery comes out on top of the list. It’s designed for lighter-colored fabrics, and works with inkjet printers. (Note: If you have a laser printer, this paper is not for you and could result in a big mess and/or damage to your printer). It comes in a pack of 12 8.5" x 12" sheets, and it’s made with the company’s Color Shield formula to keep colors bright and crisp, even after repeated washing. The Avery website has a variety of templates and clip art you can use, or you can work with your own digital photos or art designs. Customers say the paper works well, is easy to use, and they find the company’s website helpful. Some do stress, however, that you need to follow the directions very closely or you may be unhappy with the results. If you have a laser printer, it can be a bit more difficult to find iron-on transfer paper, as most are made for inkjet printers. This one from Forever gets top marks though. It’s made specifically for dark colors, and it can be used on a variety of materials including denim and leather. It comes with 25 sheets of 8.5" x 11" paper. The paper is transparent, which makes for precise positioning, and a special top coating means it will stand up through washing. The majority of customers say it produces clear, vivid images, and while it’s a bit expensive, they say it’s worth it for the quality. For transferring images onto a white t-shirt or other light-colored items with an inkjet printer, this transfer paper from Koala is a favorite. Customers say it’s a high-quality paper at a relatively low price that works great for a variety of projects. They say it’s easy to print out and transfer images, and the images hold up well after washing. While some report less-than-successful results, most customers say if you follow the directions carefully, it works well and is their go-to heat transfer paper for a variety of projects. This pack contains 25 8.5" x 11" sheets of paper, which at the price, makes it an affordable way to spruce up your t-shirts or other items. Avery makes our list again for this transfer paper that’s designed to work on dark fabric. It works with inkjet printers only, but you can use it to personalize everything from t-shirts to sweatshirts, bags and beyond—pretty much anything that’s made of 100 percent cotton or cotton/polyester blend. Hundreds of customers say it’s the one they turn to for clear, lasting images on darker fabrics. As with all the Avery products, you can visit their website for access to downloadable templates and clipart or you can freestyle your own. If you have an inkjet printer, this paper is just what you need for all the custom creations you can imagine. From t-shirts to coasters, leather goods to puzzles, this paper works on them all, and with 100 pages in this package, there’s plenty to do them all. It’s recommended for lighter surfaces, but it stands out from other papers because it also offers room for stretch. A lot of iron-on images crack once the fabric it’s applied to is stretched, but this one allows for that to prevent those annoying cracks. Customers love this paper for a variety of projects. They say it’s easy to use, the price is good, and the images hold up well even after repeated washing. Take your images to the next level with glow-in-the-dark transfer paper. It works much like traditional iron-on transfer paper, but it emits a groovy glow. You simply cut out your letters or design (in mirror image), then iron it on per the instructions. Peel the clear film off, and you’re ready to go. To get the glow on, it needs to be “charged” via sunlight. For every two hours it’s exposed to sunlight, it glows for 10 hours. It’s great for Halloween customers, slumber party attire, pillowcases, and more. This package comes with four sheets, each of which measures 10" x 12". No matter if you want to transfer onto dark material, light material or something in between, this paper from PrintWorks works for them all. You can transfer to hats, t-shirts, bags and more of any color. Easy to use, the company promises that even beginners can make a masterpiece in less than 10 minutes. Like most iron-on transfer papers, this one is designed for inkjet printers. A fade-resistant coating protects the images through washing, though it’s recommended that you wash garments inside out on a cool temperature. Some customers note that the sides of the paper could be labeled more clearly, but overall people who use this paper say it works well, and the images last. Neenah Paper is a favorite for many when it comes to iron-on transfer paper. While they make paper in various sizes, these 11" x 17" opaque sheets are great for images that won’t fit on traditional 8.5" x 11" sheets. For use with an inkjet printer, you can transfer onto light or dark-colored items, so it’s versatile, and the images are sharp. Customers say it’s easy to use, transfers well, and more than one reviewer deems it the best transfer paper they have ever used. A few say the images are stiff once applied to the fabric, but the majority give it high marks all around.